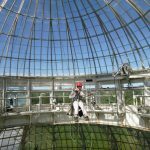 Vertical Access was retained by Robert Silman Associates to investigate existing conditions of the upper dome and cupola at the Enid A. Haupt Conservatory of the New York Botanical Garden. The scope of work included: hands-on inspection and documentation of conditions using TPAS® (Tablet PC Annotation System) with digital photography and video hyperlinked to annotated AutoCAD drawings, and the procurement of building material samples to aid in conditions identification. 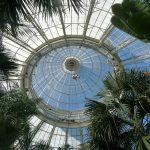 The Enid A. Haupt Conservatory is a Victorian glasshouse designed by the renowned greenhouse company of Lord and Burnham and completed in 1902. 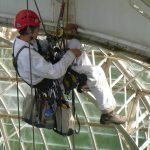 Its design is based on the Palm House at Kew Gardens as well as Joseph Paxton’s Crystal Palace. 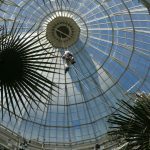 The central pavilion of the conservatory consists of an upper dome, approximately 42 feet in diameter and 25 feet in height, atop a lower dome, approximately 100 feet in diameter and 60 feet in height. Each dome is composed of 22 glass facets separated by steel ribs. Above the upper dome is a sheet metal clad cupola that is octagonal in plan. 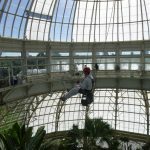 The conservatory houses a permanent exhibition of plants from 11 distinct habitats around the world. Design an access system to permit hands-on inspection in tight locations with zero impact to the structure and grounds. Document corrosion and measure thickness of structural steel members in areas unreachable with standard means of access. Satisfy clients’ need to see conditions up-close in hard-to-reach areas in real time during the inspection. 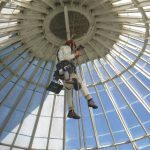 Worked with project team to research and analyze access options, choosing a combination of industrial rope access and aerial lift. Used electronic calipers and an ultrasonic thickness gauge to provide measurements of section loss due to corrosion at areas unreachable by client. Opened probes in wood fascia to document hidden connection details. Provided live-feed, high definition video and real-time audio communication with project team on the ground enabling them to see the conditions up-close.